MUMBAI: Even as Tamil general entertainment channel (GEC) Sun TV continues to maintain its number one position across genres in India, there have been three new entrants in the list of Top 10 channels across genres. DD National, Sony Max and Malayalam GEC Asianet entered the top 10 list this week, according to Broadcast Audience Research Council (BARC) all India basis (U+R) data of week 42. Sun TV was the most watched channel in India in week 42 and grabbed pole position with 1151458 (000Sums) followed by Hindi GEC leader Star Plus in the second spot with 804448 (000Sums) and Colors in the third spot with 682422 (000Sums). Zee Network’s free to air (FTA) channel Zee Anmol grabbed fourth position with 652737 (000Sums) while Zee TV ranked fifth with 649798 (000Sums). DD National made its entry in the Top 10 list across genres at the sixth position with 567433(000Sums) followed by Hindi movies and events channel Sony Max, which made its debut in the seventh spot with 525073 (000Sums). Life OK was eighth on the list with 513149 (000Sums). 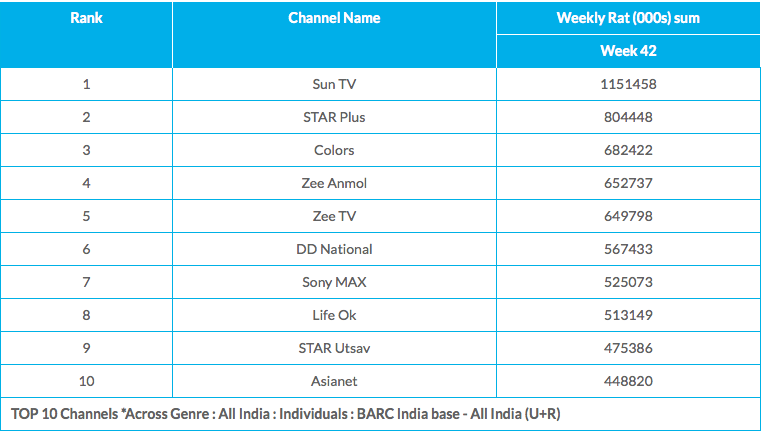 Star India’s FTA channel Star Ustav bagged the ninth spot with 475386 (000Sums), while Asianet took hold of the tenth spot with 448820 (000Sums). Channels, which featured in the Top 10 list across genres in week 41 and failed to hold on to their positions in week 42 are Star Gold (sixth), Zee Cinema (tenth) and ETV Telugu (ninth).